Below please find an updated list of bills OCPA Impact is watching for potential use in the legislative scorecard we will release following Oklahoma’s 2016 legislative session. Several bills have been added to the list. To search for more info on any of these bills, please visit the Oklahoma Legislature’s bill search tool. Below please find the initial list of bills OCPA Impact is watching for potential use in the legislative scorecard we will release following Oklahoma’s 2016 legislative session. There are two groups of people in America today: those who work for a living — whether in the public or private sector, employers or employees — and those who do not. Oklahoma must adopt policies that grow the number of working people in the state. Every state except Michigan saw raw population gains in the last census period. And states consistently see gains in the number of people not working. Working men and women pay the bulk of the taxes in any given state. With these dollars, state governments fund schools, roads, prisons and other services. In the “Obama economy,” Americans have been squeezed ever-tighter by federal taxes and regulations. As a result, state tax and regulatory burdens — including tax rate differences from one state to another — have more noticeable effects on the margins for employers and families. States consistently leading the nation in economic growth, like Texas, Florida, Arizona and Wyoming, tend to attract more taxpayers than they lose and are better able to fund core government functions. Most charge no income tax or lower tax rates than their neighbors. States with more workers and taxpayers leaving than staying, like California, Illinois and New York, typically have punitively high taxes and excessive regulations on private-sector activity. From 1992 through 2011, Kansas saw personal income outflows three times greater than what Oklahoma suffered, as productive citizens left for greener pastures. There’s a difference, though, between the two states’ trajectories. Kansas continued losing taxpayers each year. Oklahoma saw a turnaround in 2005, when the largest income tax reductions in our state’s history took effect. Since then, Oklahoma has seen increases in the number of taxpayers living in the state each year, even during the recession. This surge predates, but was certainly aided by, the fracking boom. It has helped produce record funding for schools, roads, Medicaid and other programs. To experience the successes of states like Texas and Wyoming — two of the best for business (see here, here) — Oklahoma emulated their policies of lower taxes on work and productivity. After his 2010 election, Kansas Gov. Sam Brownback began putting pieces in place for a similar resurgence. Kansas had undergone a “lost decade” of economic stagnation. Brownback’s centerpiece was a major reduction — and eventual phaseout — of his state’s income tax. By the end of Brownback’s first term, he and growth-minded legislators reduced Kansas’ top tax rate from 6.45 percent to 4.8 percent, eliminated the tax for small businesses — who create a majority of the state’s private-sector jobs — and locked in a gradual phaseout for all Kansans. Brownback wanted Kansas’ economy to be “a lot more like Texas and a lot less like California.” A worthy goal. Since the start of the recession, more net new jobs have been created in Texas than in the other 49 states combined. After the 2010 Census, California failed to gain a congressional seat for the first time; Texas gained four. The results since the Kansas tax cuts took effect have been undeniably positive. 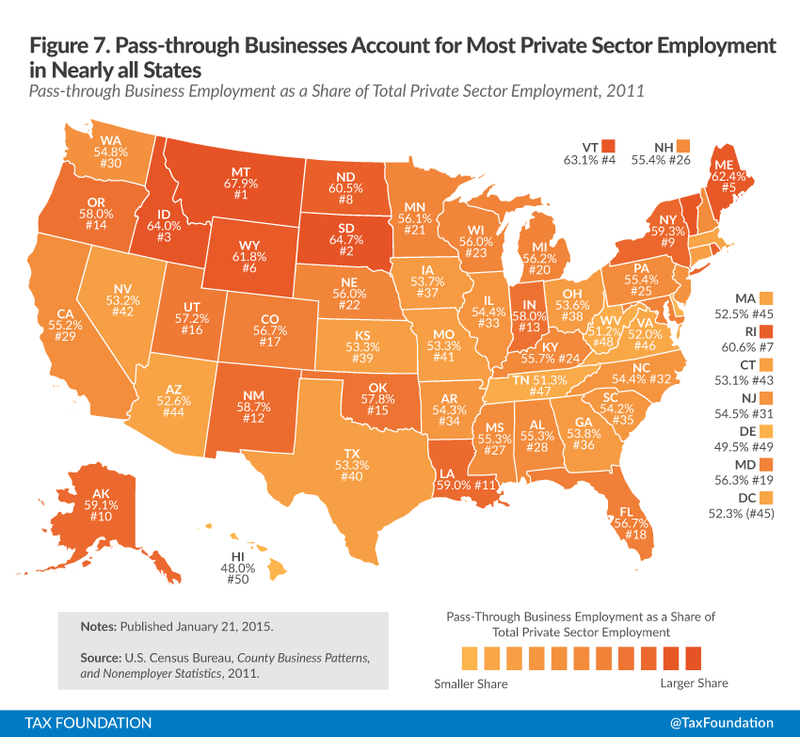 Kansas is seeing record new small business creation, unemployment is noticeably down, and private-sector growth is beating most nearby states and the national average. The Small Business and Entrepreneurship Council has upgraded its rating of Kansas’ business climate. Dynamics between Kansas and Missouri illustrate how, since lowering tax rates, Kansas is more competitive for jobs and growth. Missouri has among the highest taxes in the region, and Kansas City, Mo., charges a citywide income tax. Kansas is reducing tax rates, and its side of the Kansas City metro has no city tax. In the 28 months with the Kansas tax cuts in effect, Kansas City, Kan., has outpaced Kansas City, Mo., in job growth and private-sector expansion. Sometimes income tax reductions, by spurring economic activity, help produce higher tax collections. This was true with Ronald Reagan’s tax cuts in the 1980s and with the gradual reduction of Oklahoma’s income tax from 2005 through 2012. Kansas is perhaps more challenging. Kansas trimmed one-fourth of its income tax in one year; Oklahoma did so over eight years. In the first full fiscal year with the Kansas tax cuts in place, total tax collections fell; they have since rebounded, though not to pre-tax-cut levels. In their budget plans, both Brownback and legislators have proposed spending increases. In the midst of the Obama economy, growing the size of government is not advisable. Like in most states, though, Kansas lawmakers face cries by tax consumers for more spending. Now Brownback and the Legislature are at an impasse. Some legislators suggest increasing tax revenue by restoring the income tax for small businesses. Brownback says no. Most no-income-tax states spend significantly less on state government, per citizen, than high-tax states. Kansas spends roughly 40 percent more than the no-income-tax states. The divisive nature of Kansas politics, particularly within the GOP, can make progress difficult on many issues, including spending. Brownback’s predecessor, Mark Parkinson, switched parties in 2006 to be Democrat Gov. Kathleen Sebelius’ running mate; Parkinson became governor in 2009 when Sebelius left office early to implement Pres. Barack Obama’s healthcare law. Reducing government spending is always difficult. As Reagan said, “(i)t’s just the tendency of government to grow.” Reagan himself was unable to reduce spending while in office. Still, Kansas policymakers, like counterparts in other states, must better restrain spending to a level that can be supported by taxpayers and still promote real economic growth. It hasn’t helped that much of the public debate over the Kansas tax cuts has been driven by the Kansas City Star, which is owned by McClatchy, a California media group with an at times liberal bent. The Star has lambasted Brownback, as have usual suspects like the New York Times. The Left does not want the Kansas growth initiative to succeed. Regardless, Brownback’s accomplishments are significant. No state in the continental U.S. has ever fully eliminated its income tax; Kansas is on track to be the first. The purpose of eliminating income taxes is to increase economic freedom. Income taxes, in essence, directly penalize citizens for working; this deters people from working and producing more. People and capital are more mobile than ever, and taxpayers today can more easily relocate to welcoming climates. Brownback’s tax cuts have helped spur the private sector, benefiting Kansans. Missouri lawmakers have taken notice. Last year, they overrode Gov. Jay Nixon’s veto to enact the first income tax reductions in Missouri in over 90 years — including a 50-percent reduction of the tax on small businesses, in direct response to Kansas. Newly elected governors, including Nebraska’s Pete Ricketts, are working to reduce tax rates to keep up. New Arkansas Gov. Asa Hutchinson signed a tax cut for middle-income households. Oklahoma taxpayers, particularly small business owners, are now in what Gov. Mary Fallin has called an “income-tax sandwich” between Kansas and Texas. From 1992 through 2011, Oklahoma stole $247 million in Kansas taxpayers and income. With Brownback’s tax reductions, it’s unlikely Oklahoma will continue luring Kansas workforce and capital at such a clip. Kansas families, taxpayers and entrepreneurs are better off today than four years ago, thanks to Sunflower State leaders who believe in unleashing economic potential in individuals. If this motivates Oklahoma policymakers to further reduce our state’s income tax burden, as it has in other states, Oklahomans will be better off also. -In the past quarter-century, Oklahoma has experienced three distinct Republican electoral waves. The first two led to historic improvements in Oklahoma’s economic climate. The first wave, 1994, resulted in Right to Work becoming law in Oklahoma. The second, 2010, led to landmark workers’ compensation and tort reforms. The third, 2014, presents a golden opportunity to lock in a responsible phaseout of Oklahoma’s burdensome income tax. -All three waves featured Mary Fallin in a pivotal role. In 1994, she was elected as Oklahoma’s first Republican lieutenant governor and the first woman to hold the office. As presiding officer of the state Senate, she broke a tie vote and allowed Right to Work to advance to the ballot. In 2010, she became the first woman to be elected Oklahoma Governor. As chief executive, she signed workers’ compensation and tort reforms into law. Now, after being re-elected in 2014, and with the largest GOP legislative majority in state history, Gov. Fallin has the opportunity to yet again make history. -Every tax-cutting governor on the ballot Nov 4 was re-elected: Scott Walker in Wisconsin, Rick Snyder in Michigan, Susana Martinez in New Mexico, John Kasich in Ohio, Rick Scott in Florida, Paul LePage in Maine. And Sam Brownback in Kansas. In the past three years, Brownback eliminated state income taxes on small business profits, lowered the income tax rate under 5 percent for all Kansans, and locked in an extended phaseout of both the personal and corporate income tax. Liberal and conservative media alike expected Brownback to be defeated in his re-election bid. Instead, he and his tax-cutting peers across the country showed that reducing taxes on work, earnings and production is not politically unpopular. -Candidates for open governorships were already signaling their intent to reduce income taxes on families, individuals and job creators. Pete Ricketts in Nebraska — in an “income tax sandwich” between Kansas and no-income-tax South Dakota (similar to Oklahoma’s position between Kansas and Texas) — has said he will work to reduce income tax rates. So has Doug Ducey in Arizona, tired of seeing California tax refugees pass over his state en route to no-income-tax Nevada and Texas. Ricketts and Ducey, now elected, can be expected to lead their states in competitive directions. Also, several gubernatorial contests in states where governors had recently raised taxes saw those offices flip to the other political party, including in Illinois, Maryland and Massachusetts. -During her campaign, when discussing issues outside of pushing back against Pres. Obama’s extensive overreach, Gov. Fallin perhaps turned most often to her efforts to lower Oklahoma’s income tax. Her 2012 proposal to phase out the tax over time was the boldest policy initiative of her first term. Now, Oklahoma is presented with a window of opportunity to realize the biggest remaining game-changer in the 50-state competition for jobs and growth. This window isn’t guaranteed to stay open beyond 2018, as anyone who thought Steve Largent would succeed Frank Keating as Governor in 2002 — after Republicans had taken back control of Washington, D.C., and Oklahoma’s electorate had shifted back toward the political middle — can attest. As we near the first of four legislative sessions comprising Gov. Fallin’s final term, there’s no better time than now to secure a responsible phaseout of Oklahoma’s income tax.